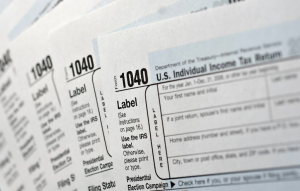 The Camden County Library branches have paper copies of the federal 1040 tax form. The State of New Jersey no longer provides paper forms for the public. You will need to request paper forms from the state, print out forms using a computer, or file your return electronically. Use the links below to download federal and state tax forms and instructions. You will need Adobe Acrobat Reader to view these files. If you have questions about your taxes you can use TeleTax, the IRS toll-free telephone service that provides both recorded tax information and automated refund information. You can also visit your local IRS Office. Tax booklets and forms were mailed the first week in January to every New Jersey household that filed paper returns without using tax preparation software last year. If you have not received your booklet by the second week in February, or if you do not expect to receive a booklet and need to obtain one, you can file your taxes online using NJ WebFile, submitted electronically using NJ Fill'nFile or file using tax software. If you file your taxes electronically and are due a refund, you will receive it more quickly. You can also visit a Division of Taxation Regional Office to obtain forms. Normal hours of operation are 8:30 a.m. to 4:30 p.m. Monday through Friday, except holidays. You can fill out NJ tax forms online and print them out. You can also print out NJ tax forms and fill them out by hand. You can then mail them through the U.S. Post Office. If you use the library's computers to print out the forms, printouts are $.15 per page. Be aware that while the forms are just a few pages, instruction booklets are quite long. Tax help from VITA (Volunteer Income Tax Assistance) and AARP for low and moderate income taxpayers and seniors. Processing of simple returns only. Must bring Social Security card and a current government-issued PHOTO ID. February 5 – April 11, 11 a.m. – 1 p.m.
Wednesdays, January 30 – April 10, 4 p.m. – 7 p.m.
Fridays, February 1 – April 5, 1 p.m. – 5 p.m.
Saturdays, February 2 – April 6, 10 a.m. – 2 p.m.
February 4 – April 15, 10 a.m. – 1 p.m.